Before I get started, let me first apologize for the pictures in this post - I only had time to snap quick photos (some with a cellphone) before we ate! 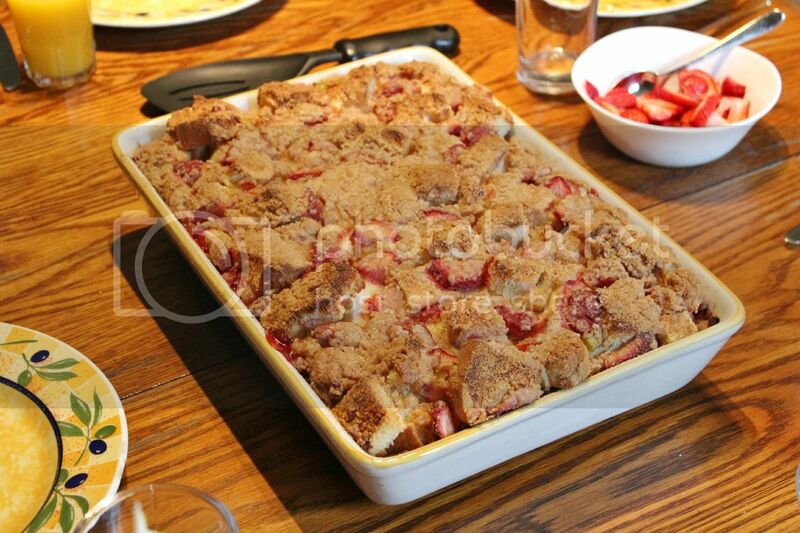 For breakfast this year, we decided to make this strawberry rhubarb baked french toast from Two Peas and Their Pod. It was almost more like a bread pudding than french toast (because the bread is cut up into cubes) but it was so delicious! We loved that we could do most of the prep work for it the night before so all we had to do in the morning was throw together the crumble topping and bake it in the oven (though we did have to wake up pretty early since it needs a long time to bake)! I would highly recommend this for your Mother's Day brunch next year, or any special occasion where you don't mind an indulgence like this to start the day! 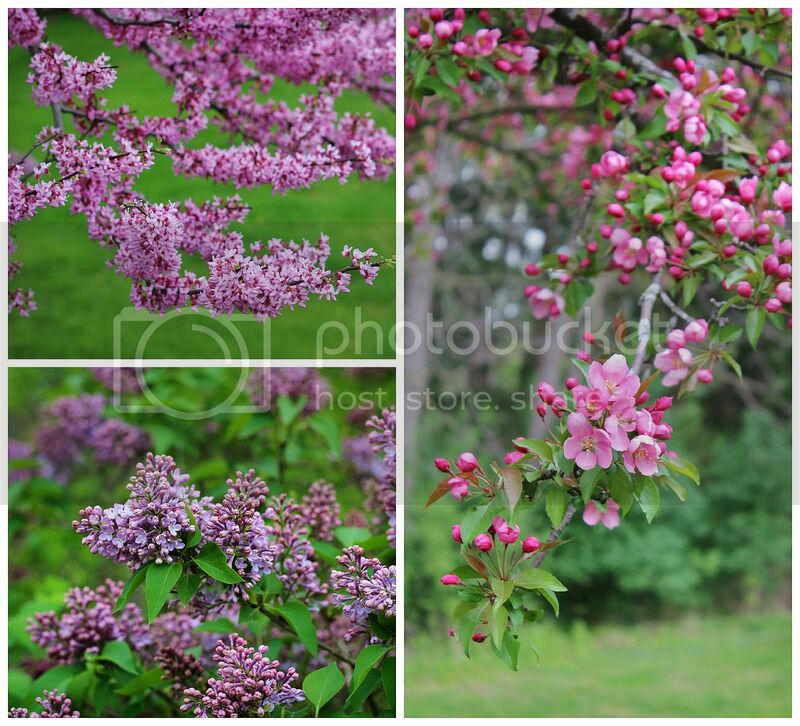 After brunch our family took a stroll through a beautiful park to take pictures with the blooming trees and flowers. My dad got some great pics of our mom with her daughters! After our walk, it proceeded to snow and hail in the afternoon - not the best weather for Mother's Day! We spent the afternoon indoors though, as my sisters and I took our mom to see Dance Legends. It was a lot of fun - kind of like a giant live episode of So You Think You Can Dance, but with singing too! If you're in the London area, go see it this week - last day is May 18! 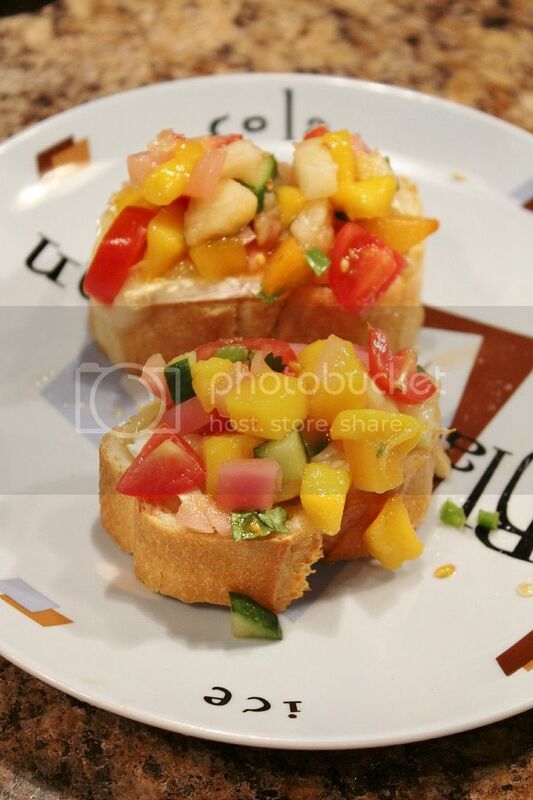 While Mom relaxed afterwards, we prepared an appetizer for everyone which we called rainbow salsa & brie on crostini. The recipe was inspired by this peach salsa with pickles red onions and chile, but our version of salsa had mango, peaches, apricots, tomatoes, cucumber, jalapeno, mango hot sauce, lime juice, cilantro, and pickled red onions. Then we warmed up some sliced baguette with brie in the oven and served the salsa on top like crostini. It was so good! For dinner, our mom chose two salad recipes. To start, we had this mixed greens and goat cheese salad with blueberry glaze, which looks horrible in the picture below but was really good! 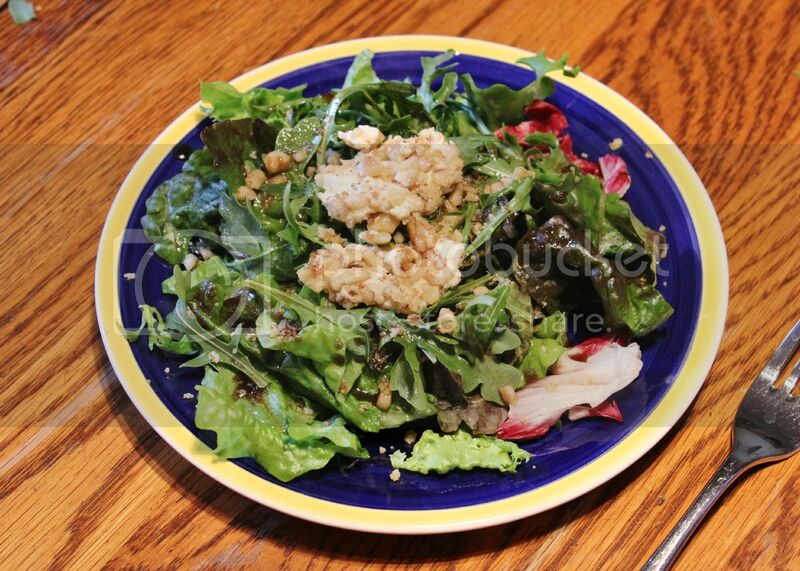 The salad was easy to prepare but tasted gourmet - the base was just mixed greens, then we added goat cheese that had been sliced into rounds, coated in walnuts, and warmed in the oven, along with a sprinkle of additional toasted walnuts. The dressing was a mixture of olive oil, wild blueberry syrup (which you can get at the grocery store), a bit of maple syrup, garlic, and salt and pepper. I was skeptical because it didn't sound like much, but everyone really enjoyed it. For the main dish, we had a tabbouleh salad, which required a bit of prep time to prepare but was quite easy to put together. 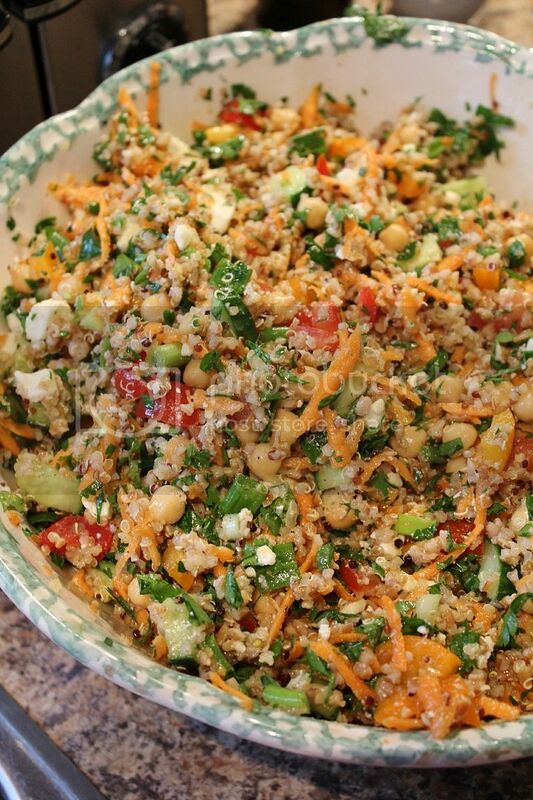 The salad was a mixture of bulgur and quinoa with chickpeas, tomatoes, yellow pepper, green onions, carrots, cucumber, parsley, mint, feta, and a lemon-olive oil dressing. This was a nice light and refreshing dish to balance out the heavier breakfast we started the day with! 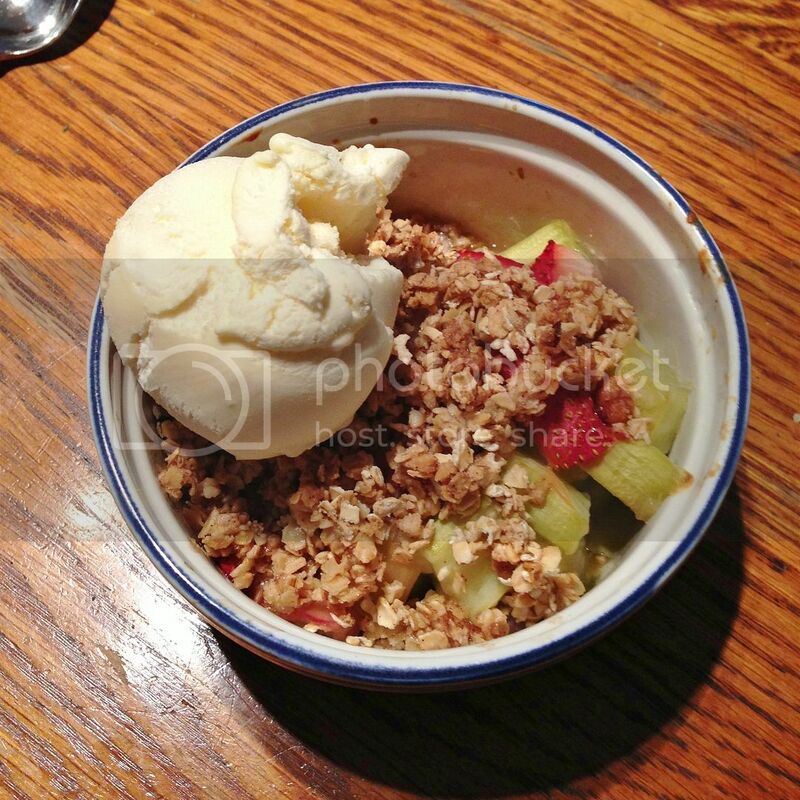 For dessert, we had a strawberry rhubarb crisp with a side of ice cream - the perfect way to end the meal and the day! Hope all the moms out there had a lovely Mother's Day and those with fantastic moms, aunts, sisters, friends, or other mother figures in their lives spoiled them! I'd love to hear how you spent your day so I can start getting ideas for next year!